Emily Visits Violaland, Part 5/? I published this on violinist.com a while ago but forgot to put it here. Whoops! We talk a lot on this board about good teachers, without often defining what a “good teacher” is. Whatever a “good teacher” is, I have one in PVF. It’s always a little disorienting when you befriend someone, and you think you’re getting a handle on who they are, and then suddenly they surprise you with a random blinding talent. PVF’s teaching ability has been one such pleasant shock. I didn’t have a phone or a watch on me, so I’m not positive how long we spent working, but it was over an hour. PVF made good use of the time, chatting, demonstrating, exaggerating, tweaking, thinking, notating, singing, dancing, and even sharing some inconsequential viola-y gossip in between the brain-twisting. That night I wrote a list of the things we discussed, and I came up with around forty. Talk about intense. I went into the lesson stoked to show off my new relaxed bow arm. That had been the main focus of my last lesson with PVF in January. I’d really taken his suggestions to heart, and I’d spent a lot of time in front of the mirror, and I was finally feeling confident I was playing (drumroll, please) Tension Free! As soon as I finished the Prelude from the first Bach suite, PVF gently pointed out that the tension brought out by the difficulties of the string-changes had not actually disappeared; instead, it had just…moved to my left hand. And so the endless game of Tension Whack A Mole continues! I was instructed to play the notes above the fingerboard without touching the string, and then to stop them as lightly as possible. Think of the third and fourth fingers as the base for contact instead of the first finger. Let the elbow be flexible and move around to support them. My fourth finger wasn’t coming down smoothly; it was either in an up position or a down position, and when it did come down, it whacked the string with unnecessary force. To help, PVF prescribed a nerdy tabletop finger exercise that will cause people to look at me strangely in public. Within a few minutes, everything began feeling much more relaxed. It felt easy and effortless and exhilarating. It really is surprising how little weight is needed to stop strings, even on a viola. One passage (measure 19 of the Bach G-major prelude if you’re following along at home) was coming out consistently problematic. It was a descending line of sixteenth notes with a simple down-up-down-up bowing pattern. But I was pulling on the downs so much that it was all very choppy. PVF instructed to accentuate the up-bows. I tried that. Then he told me to accentuate even more. And even more. I finally ended up feeling like I was making all the downs staccato and all of the ups a sweeping legato. “That,” he said, “was the smoothest you’ve played it yet.” Well, okay, then. Once again, a reminder that what we feel under our fingers is not always what the audience hears. I was so busy with the notes themselves that I wasn’t paying much attention to the dynamics. “Exaggerate those,” PVF encouraged. “Play completely tastelessly.” I tried. “No, not tasteless enough.” I tried again. “Nope, still way too tasteful. Break up the bows, do something. Make it just totally over the top. Feel what that feels like, and then apply that feeling to the correct bowing.” Alas, I never did lose all my taste entirely, but I’ll work on it. This was rather a liberating idea. I’m going to have to apply it to other instances when I’m being too straight-laced. Sometimes we need to allow ourselves to go wild…if only for an experiment to see how far we can push our intensity of expression. PVF suggested that it might be interesting to think of the notes after the fermata at measure 22 as a classical era cadenza. Measures 20 to the fermata at 22 are the orchestra with their closing thoughts; the fermata at 22 to the C at 29 is the cadenza; the C at 29 is the orchestra gently coming back in. 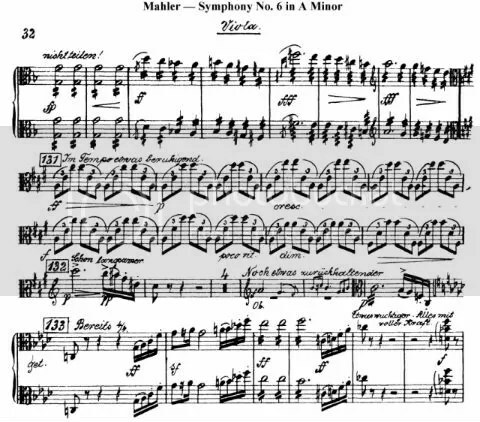 Thinking that way lent a real sense of cohesiveness and momentum to the second page of the movement. My Skepticism About the Allemande! For some reason I have always found this movement problematic. I don’t know why. It just seemed kind of…there? Kind of long-winded? I don’t know. We’d spent a while with the Prelude and were pondering going to something else entirely when I turned the page to the Allemande and made the fateful, offhand comment that I thought it was boring. Heh. Maybe I am a violist, after all. Yeah. He does have a point. We worked quite a bit on phrasing. The first four measures are a prime example of what can be done with a seemingly simple set of notes. The pattern starts out with a G that comes back over and over. Don’t emphasize that as much, because it doesn’t change for quite a few measures, and it can start to feel monotonous. Pay the most attention to the changing notes on top. Notice what chords they make. What narrative can that chord pattern be transferred into? Confidence, followed by a slightly less confident thought, followed by true doubt, followed by encouraging reassurance? Try playing the chords unbroken. Don’t they sound familiar? They should; they’re in the Sarabande. No note is an island. Everything is part of something else. The prelude may be an unrelenting series of sixteenth notes, and for the most part it is, but it also has a narrative arc. Don’t be so caught up in what finger goes where and what angle the elbows have to be at that you lose sight of what you’re saying. This is an easy trap to fall in. Communication sometimes takes a back seat to learning how to actually do the darn thing. But that is like spending hours and hours learning how to clean a stove, and then not actually baking anything. What’s the point (unless you get some weird twisted thrill from stove-cleaning?). Humanity: easier said than done. As we were packing up, we somehow got onto the topic of what size instrument I was playing. “What size is that one again?” he said. “A fourteen.” I took off the shoulder rest and slowly turned it around, looking at the front, the side, the back. “It’s nice for the size and for the price, but…” I thought back to all the work I’ve done with relaxation, all the hours I’ve spent in front of the mirror. All the dismayed expressions I’ve made when the rich gutsy viola sound I wanted just wasn’t there. PVF smiled. Muahaha, I’m sure he was thinking. Mua-ha-ha-ha-ha. Emily Visits Violaland, Part 4/? A few days ago I submitted a question for discussion on the violinist.com discussion board: Where is the dividing line between “a violinist who plays the viola” and “a violist”? I’ve been thinking a lot about the subject. At the end of June I’ll have played the viola for six months. Alto clef is under the fingers pretty well. I’d feel comfortable taking on stuff like the Haydn quartets (as long as I’d have time to learn and finger them beforehand). I bought my first viola sheet music. The first Bach suite is mostly memorized. I’ve had two lessons with a wonderful viola teacher. I’ve relaxed my right shoulder, stopped squeezing the neck, raised my bow elbow, and tweaked my posture so the scroll sits higher. The violin feels much more manageable, I can finger simple viola parts for orchestra arrangements, and I’ve learned some new viola jokes. In short, I’ve actually achieved the majority of what I originally set out to do with the instrument. As I observed in my first Violaland blog entry, in the words of Edith Lynwood Winn, “Every violinist should play the viola to some extent,” and now I do. So the rental should go back to the shop, right? If I keep it, I’m looking at spending money I don’t have, which even if I did have, should go to a decent violin bow, or to a string and rehair fund, or to fun silly frivolities like groceries or rent. But… (and you know where this is going, don’t you?) …in a few days, I’m signing the papers for another three-month lease. And not only that, but I’m returning the 14″ and bringing home a 15″. I feel like Moses catching sight of the promised land, realizing it’s time to hand over the reigns to Joshua. But you know what? Screw that. Because I spent forty years (six months) leading the Israelites (my fingers) through the desert (Schradieck), and now I want to enjoy the fruits of my labor. With the basics out of the way, there are bigger instruments to conquer, richer colors to explore, new techniques to analyze. There are harmonies to savor. There are more complicated ensemble parts to take on. There’s the Clarke sonata, floating out there in the distant ether. There are five other Bach suites I haven’t even touched (apparently six sonatas and partitas were not enough to take on in one lifetime). In short, there’s this whole big viola-y world out there. And I was kidding myself to think that I could learn the basics and then quit. Over the last six months, I’ve begun to love the viola for what it is, not for what it can give to my violin playing. And that means I’m ready to call myself a violist. Emily Visits Violaland, Part 3/? This week marks my fourth as a wayfaring stranger in Violaland. I thought that now might be a good time to take stock and figure out where to go from here. I’ve been playing an hour of viola a day, as well as an hour of violin. When I first asked for advice for a violinist taking on viola, someone mentioned not to slack on the violin. I remember thinking, “Thanks, Captain Obvious,” but here’s the weird thing: once you start, it’s not obvious. It’s so easy to focus on one or the other, and to start gravitating toward either the sonic thrill of a new instrument or the familiar comfort of an old one. But you must not allow yourself to backslide on the fiddle, and that in turn means committing to the viola wholeheartedly. The viola is not a side-project. So far I’ve combatted favoritism by telling myself that for every half hour spent at the viola, I have to guarantee a half hour will be spent at the violin, and vice versa. I also mix up my practice sessions; every day I alternate which instrument I start with. So far it seems to be working. Most of the changes have been in the right arm. Right now, I’m focusing on relaxing the shoulder and elevating the elbow. I had a brief discussion with Professional Violist Friend (PVF) about this at the lesson. With the relatively low elbow I’d been employing before, he wondered if I’d ever had any pain or discomfort in my right arm. I was so tempted to cackle bitterly before launching into a detailed description of my battle with right arm nerve pain, in the kind of overwrought explanation that an old lady would give at a family reunion when an unsuspecting relative asks about her bum hip. (Thankfully, I resisted the temptation to go into all the awful details.) But the truth is I’ve struggled with bouts of unbearable nerve pain for a decade now. It comes from the pinky and the ring finger and goes all the way past the elbow, into the neck, and down to the toes. (For those who don’t know, I have health problems that exacerbate nerve pain. I’m aware that’s an extreme physical response.) Anyway, after some experimentation, I’m wondering if the low right elbow made those two fingers stiff. Over time, stiffness led to pain. Add in tension from a lowered chin and high shoulder and gritted teeth, and voilà. (Or should I say viola? … Maybe not.) I’m wondering if, with the higher elbow, maybe the code to nerve-pain-free playing has been cracked. I say “maybe” because it seems too wonderful to actually be true, and I don’t want to jinx it. And also because it’s humiliating to think I’ve sobbed in pain because of two stiff fingers. Anyway, this month my bow arm has felt much more relaxed and efficient, both on the violin and the viola. I’ve also taken on the no-doubt creepy-looking habit of closing my eyes halfway to three-quarters of the way. It might make me look high, but as long as nobody’s watching… It’s an expression that helps release facial tension. The left arm has not been without its adjustments, either. I’ve decided that if I can’t see my elbow through the c-bout, it’s not tucked under enough. I need all the help I can get to stop those strings. Obviously this might be too extreme of a position for other players with different body types, and at times it’s almost too extreme for me (especially when I’m playing on the A-string). But I’ve still found it’s a good goal to shoot for, since I usually fall a little short of it, anyway. This change in position also necessitates some changes with the left wrist, since it’s tempting to arc it away from the neck. I’m having to bring the wrist in more so that it’s more in line with the arm. Clef-reading has been coming along surprisingly well. I keep waiting for a massive roadblock, but it hasn’t come. The progress is slow but steady. To give a general idea of where I’m at, I can sight-read maybe three-quarters of the first Bach cello suite (not up to tempo, but the notes are largely there). Schradieck has been my savior; it’s just worked so well, especially since I know the exercises from violin. The exercises on one string (the D string in the transcription I’ve been using) really really really hammer the notes home. In fact, it works so well that I’m planning on transcribing it for the other strings. Ševčík , surprisingly, has not been nearly as helpful, although it too has been worth doing, if only to practice the elusive art of shifting on the viola. (Perhaps it will become more relevant once I get alto-clef in first position mastered.) One area I’m still very weak in is naming the notes. I know where to put my fingers, but I can’t tell you what note that is without taking a second or two to think about it. I suppose this will come in time. I guess when I think about it, twenty-five or so hours of playing is not a lot of time to totally learn a new clef. And I’m not a prodigy by any stretch of the imagination. So I’ll cut myself some slack on that one. I make a point to sight-read something every day. Right now I’m working on the viola part to the Mozart G-major violin-viola duo. It’s slow, but… I’m hoping that once I get my orchestra music for the semester I will start picking up sight-reading skills faster. 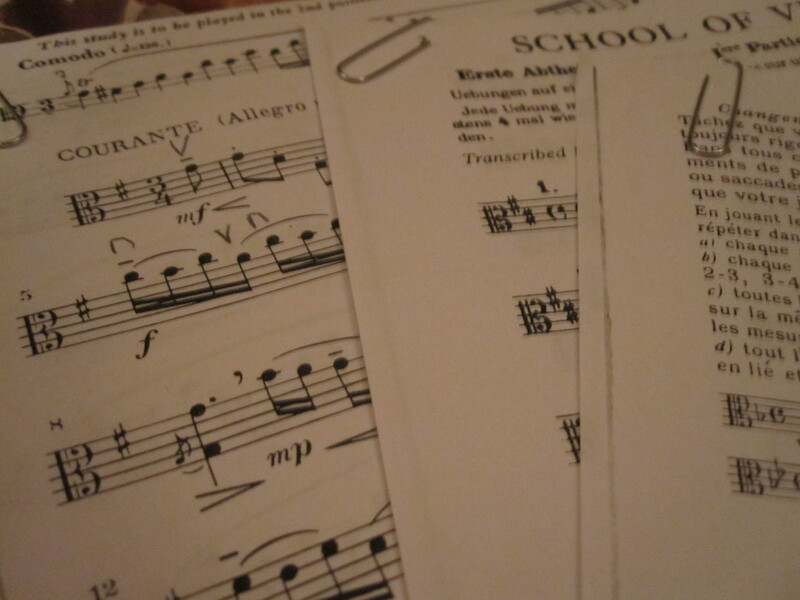 Maybe eventually – gasp – I will be able to play in positions without my brain splattering all over the music stand. That would be a cool and welcome development. Another awesome unexpected benefit has been mastery of second position…on violin. Yeah, I’m not sure how that happened, either. But something about learning first position in alto clef made second position in treble totally click. (???) This is something I’ve been struggling on and off with for five years; I would do all the exercises, but it just never stuck. So as you can imagine, I’ve been pretty chuffed, and using my newfound second position chops whenever I get a chance. – My voice recorder does not pick up the range of the viola nearly as well as it picks up the range of the violin. The sound seems much thinner and less complicated than in real life. Or maybe I’m not projecting well? Hmm. What I need is a set of portable human ears that I can move across the room and then connect to my brain. Does Shar sell those? – Especially in the Courante, I’m sounding weirdly like a 90-pound violinist playing a violin with a C-string while using a crappy student violin bow. Which makes no sense, since I’m a 90-pound violinist playing a 14-inch viola while using a crappy student violin bow. At this stage in the game, should I be focusing on just hitting the notes? Or should I be adding “strive for a viola-like tone” on top of changing my right and left arms and reading the clef? How does one get a viola-like tone on a 14-inch instrument anyway? Especially when you’re forced to use a crap violin bow? (Sadly, upgrading won’t be an option for a very long time, and the viola bow that came with the rental is so awful I’m tempted to see if carbon-fiber bows are really as indestructible as their makers claim. I’m thinking a ritual massacre by steak knife…) Anyway, one possible solution I came up with was to slow the tempo down, because the viola clearly needs more time to speak and resonate than I’m used to giving the violin. What do you think? Would this help at all? – It would be nice to have a full-time teacher. Never going to happen, but it would be So. Frigging. Nice. For any violinists wanting to add on viola, keep in mind that you can teach yourself a lot, but you’re going to get a lot farther a lot quicker with the help of a good teacher. So, the inevitable question… Will I keep going with the viola? Then the next inevitable question… Where do I want to go from here? I’ve been thinking about it. It would be nice to feel familiar enough with alto clef to be able to read faster pieces at-tempo, so I guess more sight-reading and Schradieck is in order. I’ll need to work on rhythm, especially in ensembles (my rhythm’s atrocious without a metronome). Repertoire… I’ll continue my traversal of the Bach first cello suite, but I also have a viola transcription of Fauré’s Élégie for cello. Fauré is my favorite composer, and IMHO the Élégie doesn’t sound very good in the violin transcription, so… Even if the Élégie proves to be too challenging, I’ve got to try Après un Rêve at least. A Fauré fix is in order. Maybe from there I can take on the Bruch Romance, or something by Rebecca Clarke. Any repertoire suggestions? To close… In my last entry, I pondered briefly as to what makes a violinist feel like a violist. Since writing that entry, I came up with one of the definitive signs: when you play the violin immediately after the viola, the violin sounds completely unsatisfying in comparison. It feels like a toy – a scratchy, unresponsive, uptight, whiny toy. You finally understand the gospel truth that it is always going to be easier to switch from violin to viola. You’ve heard many other people say this over the years, and you’ve always wondered how it could possibly be true, but then suddenly you experience it yourself and you think to yourself, oh. They’re right. I still don’t love the viola more than the violin, though. They’re like my two kids. It would feel criminal to choose between them. – Emily curses fate that she has to learn all this crap without a teacher. Why God, why?? It’s so much to keep straight! Whine moan whine moan complain moan. She will then melodramatically wave a fist with calloused fingertips toward the sky. – She tries to learn to sustain the viola sound. This will involve… Um… I don’t know. Experimenting with bow changes? Something like that. I’m not sure. – She plays viola in an orchestra for the very first time. Will she be an asset to the section, or will her poor sight-reading skills make rehearsal grind to a halt like a New York Philharmonic concert interrupted by a marimba ringtone? Stay tuned. Emily Visits Violaland, Part 2/? In the thrilling first installment of Emily Visits Violaland, Emily decided to take up a second stringed instrument, gorged on viola jokes for the final time, and picked up a fourteen-inch rental that sounded surprisingly good for the size and price-point. Now comes…Part 2! Read on for the earthshattering musical secrets she discovered while taking her first lesson from a professional violist friend (known in this and other Violaland installments as PVF). I took more time tuning than I usually do, worried that the cold weather had done a number on the instrument. Thankfully once I remembered, you know, where the strings were, I found that everything was mostly still in tune, but I winced nonetheless as I played the G and C together. “The C-string,” I said. I tried to explain that it didn’t feel right, but I couldn’t come up with the words. I guess my ears still aren’t used to the presence of this new pitch, and the C sounded, for lack of a better word, weird. “Actually, most of us consider C-strings to be an advantage,” PVF said. Mmm. Touché. Once the tuning was completed, I stood and awaited a deluge of violistic wisdom. I suddenly had the fleeting thought that maybe it hadn’t been the greatest idea in the world to schedule a lesson with an extremely busy professional musician without even knowing the clef of the instrument he makes a living playing. I wondered if I was being A) really brave or B) really stupid. Yes, this was going to be fun. I’m one of the few violinists in the world who has spent more time reading about Ševčík’s life and students than I have actually playing his exercises. (Fun factoid: Ševčík had his eye whacked out by an E-string that snapped in his face. When I told PVF this, he said, “Did he really? He sure took it out on the rest of us.” Truer words have never been spoken.) So the Ševčík was…I’m ashamed to admit it…new to me. I know. I’m a very bad violinist. But none of my teachers ever introduced me to him, and I never knew where to even start. Anyway, we started out with some measures from the Opus 8. I was getting lost intonation-wise, and not sure if what I was playing was the same thing that was on the music, and being my melodramatic and perfectionistic self, I began to despair and wonder if I maybe wasn’t cut out for the viola after all. Then he said one sentence that cleared it all up. “You’re not used to the half and the whole steps.” Over the last twelve years I’ve unconsciously absorbed what marks on the clef consist of half and whole steps. On the violin, you see a note on the bottom line of the clef and then a note on the bottom space of the clef, and if you’re in C-major, you know it will be a half-step. You don’t need to consciously think “E to F, that’s a half-step, so fingers close together”; you just know. With alto clef, when you see the same thing, it’s a whole-step. So you actually have to stop and think “F to G, that’s a whole step, so fingers wider apart.” This relationship between notes is going to take just as much getting used to as the actual note names, and for some reason the thought had never occurred to me. To prove the intonation issues were mainly clef-related, we fast-forwarded to a portion where the music was written in treble, and of course things immediately became much easier. I let out a breath of relief. I also learned that it’s important to be able to recognize larger intervals. It’s obviously much easier to identify intervals at sight than to think “okay, so if this note is on the second line from the top, I need to go down to think what string I’m on, and that’s D, so now I’m on the D-string, okay, so now I need to add my fingers in, so that would be E, so first finger down, okay, well, I think this is the right pitch…” I’m more familiar with interval-recognizing as it applies to piano-playing, but that will be changing. If I can glance at two notes and see they are a fifth apart, and I know where to put my finger on one of them, all I have to do is use that same finger a string up or down. Done, and done. Another thing that helped immeasurably was PVF playing through each measure once before I began. That way I could have it in my head and focus more on the actual physical portion of playing the instrument rather than putting all the brain-power into deciphering the clef. I’m finding I can do better work by copying something tricky I’ve just heard than by trying to read it. I used to think this was a bad thing – that it was cheating or something – but I guess it’s not, as long as you don’t rely on copying by ear all the time. When we moved onto the Schradieck, my prospects grew brighter. I knew the Schradieck; I’ve used those exercises for years on the violin. So I played through a few of those. “See, look. You’re reading alto clef,” PVF said. “But that’s how you learn alto clef,” he said. “Positive. It’s just a separate place in the brain. You have treble clef, bass clef, and now alto clef.” He spoke as if this was no big deal, as if picking up a new clef is as simple as picking up a third book from the library, or a third bag of groceries at the grocery store, but the idea boggled my poor brain. However, PVF clearly knows what he’s doing, so I’ll set aside my doubt (for now) and listen to him. Especially during the Schradieck, PVF saw some tension in the left hand. Turns out I was overcompensating with pressure because I was playing a viola. It’s big, of course, but it’s not so big I need to press down on the strings like I’m white-knuckling a safety bar on a roller-coaster. That helped a great deal. It seems that if the viola is going to teach me anything, it’s going to be efficiency. Because with the viola, it seems as if you’re either efficient, or in pain. There’s not much of a middle ground…at least for me. I can get away with certain bad habits on the violin that I can’t get away with on the viola. Although the Ševčík and the Schradieck didn’t engender thoughts of suicide, we finished up with Bach anyway. He’d brought along the Courante from the first cello suite. This was a bit of good luck, as it’s a piece I’ve played many times before on violin (albeit years ago), and of course I’ve heard the cello suite many times. PVF isolated the first line, and off I went. The Courante was more of a Dirge the first couple of times through, but after a few times I found I honestly was remembering where certain notes were. There were some unnecessarily dramatic pregnant pauses as I calculated what note was where, but by the end of the session…I was reading a portion of a movement of a Bach cello suite in alto clef. Not particularly well, and not particularly quickly, but I was doing it. I thought I’d have to play something like scales or Ševčík or flashcards for weeks before I could even begin to look at something like Bach. But I was wrong; Bach turned out to be just as helpful at helping to lodge the clef into my skull as either scales or Ševčík. – The viola has a tendency to droop more than the violin because it’s bigger and heavier. (At least it did at my lesson.) Resist the temptation to let the scroll drop; it will affect your ability draw a straight bow. – Actually, full straight bows in general become even more important than they are on a violin, if that’s even possible. – Despite the instrument’s larger size, keep the left elbow tucked under; the fingers always need to be right there on top of the string ready to fall on the fingerboard. – I was having difficulties getting into and finding higher positions on the viola and I couldn’t understand why. It turns out it’s because I’ve always used the old violinistic trick of knowing you’re in third position by feeling the rib of the instrument lightly on the side of your hand. But not all violas’ third positions are located there. And mine isn’t; if I feel for the ribs, I end up about half a step sharp. Hence the feeling of being completely lost. – Don’t ever, ever tell cellists you like the Bach suites on viola. They will come and kill you in your sleep. Probably brutally and with an endpin. I ended the session fried but inspired. “This is going to help a lot of issues that I’ve just skimmed over on the violin,” I said, cheerfully nerdy. We then got to talking briefly a little about the differences between the two instruments. I said that although I love it, the sound of the viola has a tendency to make me melancholy. “Embrace the sadness,” PVF said, with a glint in his eye. So what have we learned from this installment of Emily Visits Violaland? Lesson Number 1: Alto clef is easier than it first appears. Lesson Number 2: Transcriptions of and familiarity with the Bach cello suites are very helpful. Lesson Number 3: To help avoid frustration and delusions of idiocy, it’s best for violinists who want to make the switch or the addition to take a lesson or two from a well-trained violist (emphasis on “well-trained”) (did I mention the violist should be well-trained?). Obviously the instruments look deceptively similar, but there are a lot of differences to keep in mind, and only someone who has done a lot of thinking and learning about the mechanics of the viola is going to do you any good. Don’t go to any old yahoo who just plays the viola on the side. Clearly I have plenty to work on. We’ll see if I can make a dent in some of those etudes; maybe sometime in the spring I can visit PVF again. Actually I have to, because I never did remember to ask about the secret violist handshake. Maybe I can learn that after I get alto clef firmly into my fingers. – Emily wonders what it will take for her to think of herself as “a real violist.” Why does it feel like she’s not a real violist even though she’s obviously playing viola? Do she have to play a fifteen-inch instrument? Does she have to learn a viola sonata or concerto? Does she need to play viola in an orchestra? Where will that dividing line be?